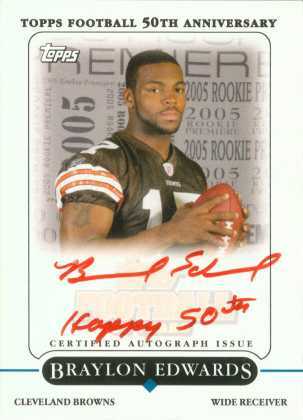 Since 2000, Topps has been giving collectors some of the most collectible and unique autographed football cards in the hobby - ROOKIE PREMIERE AUTOGRAPHS. 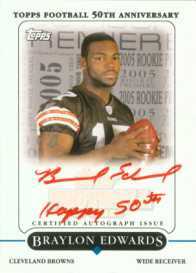 This year, Topps added a twist to the program as each NFL rookie signed 10 cards and inscribed "HAPPY 50th" in honor of the 50th Anniversary of Topps Football. All "HAPPY 50th" cards are signed in red pen. These cards along with the regular blue version (limited to 50 copies each) will be seeded into packs of 2005 Topps Football. Also appearing in the program for the first time are ROOKIE PREMIERE QUAD AUTOGRAPHS featuring such combos as Jason Campbell/Cadillac Williams/Ronnie Brown/Carlos Rogers. The special cards, which are manufactured in less than 24 hours at the Rookie Premiere a.k.a. Rookie Photo Shoot, represent a special moment for the NFL rookies as they get to see and physically hold their first NFL trading card. Each rookie is also given additional cards to give to family members, friends and fans (these cards do not include the 3M authentication sticker) and they even enjoy trading the cards with their future NFL counterparts.